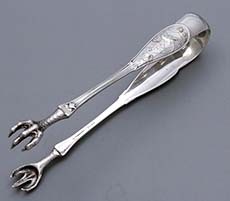 Tiffany Japanese sterling double claw ice tongs. Length 6 1/4". Excellent condition and never monogrammed. 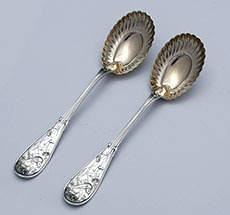 Two Tiffany Japanese antique sterling silver ruffled bowl spoons with gold washed bowls in pristine condition. Never monogrammed. 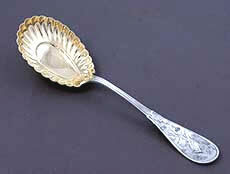 Length 5 3/4"
A fine Tiffany Japanese pattern fish server with hand engraved blade and partially gilded surface. 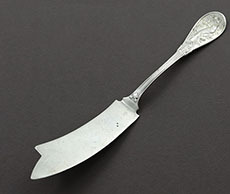 One side of the blade is raised with a ruffle. Monogrammed with a Japanese style monogram on the reveerse of the handle. Length 13 3/4". 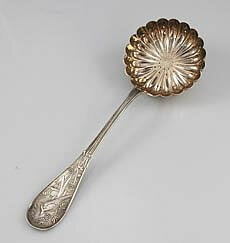 A Tiffany Japanese antique sterling berry serving spoon with fluted gold washed bowl in pristine condition. Never monogrammed. Tiffany Japanese Coffee Spoons 4 3/4"
Nine Tiffany Japanese sterling coffee spoons measuring 4 3/4" long wih gold washed bowls with the same script monogram on the back of each handle. 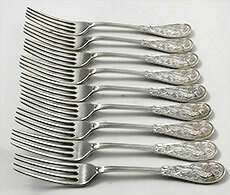 A set twelve Tiffany Japanese sterling silver luncheon forks, never monogrammed and in excellent condition. 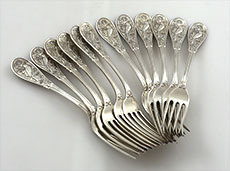 Length 7"
Nine Tiffany Japanese antique sterling silver luncheon forks measuring 7" and all monogrammed on the reverse of the handles. Excellent crisp condition. 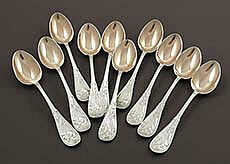 Eleven matching unmonogrammed Tiffany Japanese teaspoons. 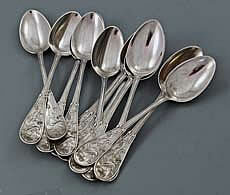 Length: 6"
Three antique Tiffany Japanese sterling oval soup spoons or dessert spoons. Monogrammed on the back of the handle. Length: 7"
A large impressive sterling silver pierced sifter spoon in the Tiffany Japanese pattern with crisp detail in the feathers of the bird. The satin finish remains perfect and the bowl is gold washed with the original gilding, satin finish on the reverse and a bright gilt in the bowl. Monogrammed. 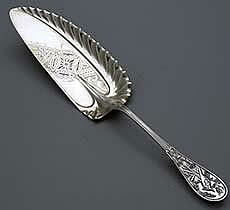 Length: 8 1/2" Bowl diameter: 2 3/4"
Tiffany Japanese pickle knife never monogrammed with crisp detail in the pattern. Length 8"